Description: 368 and 369 meeting at Mac Yard. Description: a eastbound freight passes another as the one on the right waits to head up to the yard. Description: CN 2515 now has "Flower Power" @ Neenah, while the conductor gives off a friendly smile for the camera posing just perfectly with the flowers to boost the photo. Description: CN engines # 2634 & 2515 haul a empty SORE train through Empire Jct. 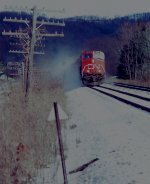 Description: CN engine # 2634 leads another empty SORE train into the mines at Empire Jct. Description: CN engines # 2634 & 2515 lead another set of empty ore cars that will make up todays SORE train into the mines at Empire Jct. Description: CN engine # 2634 & a ratty looking CN # 2515 run light into Empire Jct.